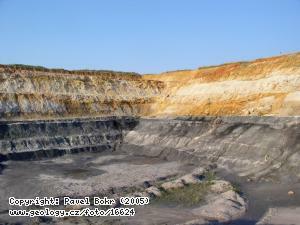 The study of sedimentary rocks is the concern of the stratigraphers, palaeontologists, petrologists, mapping geologists and other specialists from the CGS who, together, compile and interpret information relating to the sedimentary formations occurring in the territory of the Czech Republic. These range widely in age from Palaeozoic through Mesozoic to Caenozoic. Sedimentary formations occurring in the Czech Republic are chiefly clastic in origin with a small but important component of carbonate rocks and minor evaporites. Over large areas, the sub-horizontal bedding of the sedimentary rocks is preserved and sequences reach thicknesses of more than hundreds of metres. Individual sedimentary basins record the dynamic influences that governed the deposition of sediments in them. Based on detailed analysis, comparisons with the geotectonic settings of present-day sedimentary basins can be made. Research on assemblages of fossil organisms preserved in sedimentary rocks increases our knowledge about the origin and evolution of communities of extinct and living genera and species. Sedimentary basins ranging in age from the early Palaeozoic to the present are distributed across the whole region of the Czech Republic. Studies of the development, structure and composition of the sedimentary rocks in them have a direct bearing on the engineering-geological conditions that govern the planning of civil works and communications by the regional and national authorities; the assessment and protection of ground water reserves, the identification and evaluation of raw material resources, and the evaluation of natural hazards (landslides and regional contamination of the rock environment). The sedimentologists of the CGS are members of International Stratigraphic Sub-commission of the IUGS and several international working groups including INQUA and others. RNDr. Lilian Švábenická , CSc.